I created this necklace especially for this show. Although I had never even heard of paper beads before, since I make lampwork beads, making them out of paper was a natural idea. Imagine my surprise upon searching the internet, that this is an ancient art! For this necklace I chose a wall paper that has a tiny print that reminds me of camouflage, hence the name. The name is also appropriate since you would never know you were looking at paper beads unless I told you it was true. 1 1/2 inch paper triangles are drawn on the back side of the wall paper and then decoupage paste is applied. A toothpick is then set on the widest end and it is rolled towards the point, carefully keeping the alignment. Once rolled, more decoupage paste is applied. 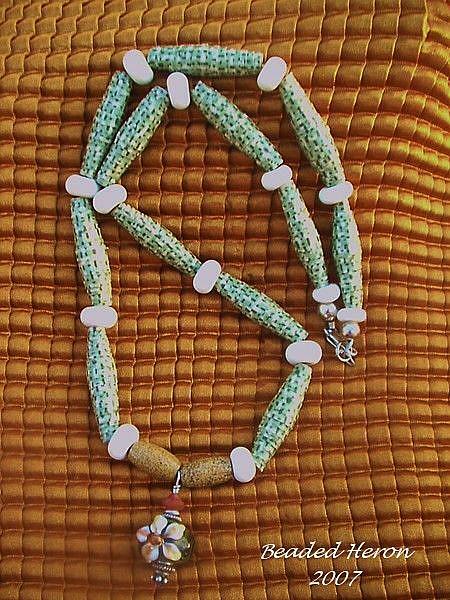 The beads in this necklace have 3 layers of paste to insure wear ability and protection from the elements, yet the texture of the paper edges remains. The ivory Italian Moretti glass lampwork spacers and floral focal bead were hand crafted by me, one at a time using my torch. Not only do they add interest to the design, but the weight of the glass makes the piece drape the neck beautifully. Two small Picture Jasper beads compliment the focal and beautifully round out the center. The necklace is strung on Softflex 49 strand beading wire strung with tiny seed beads also to help maintain it's shape and weight for wear ability. The clasp is sterling silver. I've already had a lot of fun wearing this piece and it is inspiring me to try even more styles of paper beads!